The tug-of-war between the School Board and City Council over school funding enters a new era of speculation: Will the election results produce more funds for Richmond schools? That overlooks the more fundamental question: What is the School Board doing with all the money it now is spending? The most recent data from VDOE are from 2015-16. 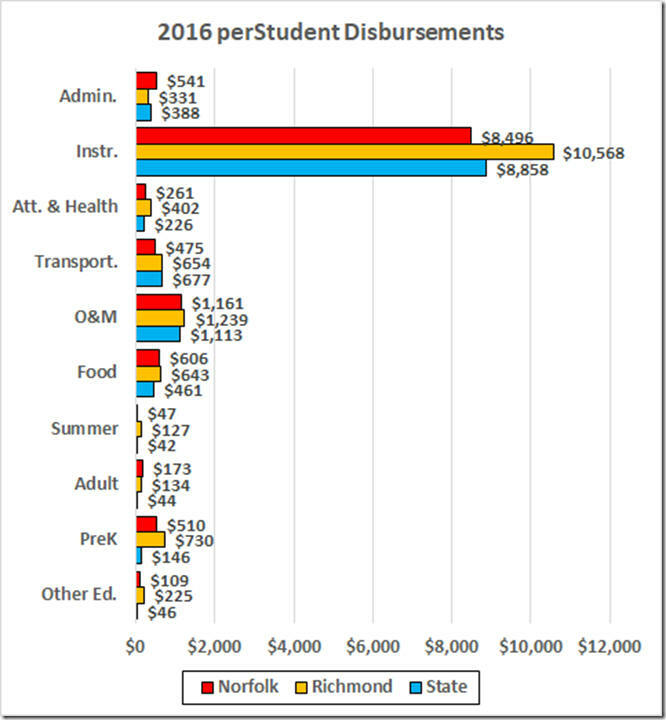 Here from that year are the per-student disbursements by division for Richmond, three peer divisions, and the state average for school divisions. I’ve left out the sums for facilities, debt service, and contingency reserve. The largest single cost for schools is salaries, so it’s no surprise that Richmond’s excess of $3,051 per student mostly went to the instruction category. Multiplying the $3,051 Richmond total excess by the 21,826 enrollment gives the excess Richmond expenditure total: $66.6 million. We can account for some of that. The 2016 average salary in Richmond was $51,263 vs. the state average of 56,320. That is, Richmond saved $11.3 million vs. the state average by underpaying its teachers. At the average salary of $51,263, that comes to an extra cost of $18.5 million. Combining those data leaves Richmond with an excess cost v. the division average of $59.4 million. This overlooks the question of what those extra teachers are doing for the RPS students. To judge from the SOL scores, it’s more a question of what they are doing to the students. The difference in adjustments is 5.8%; that is, on those (old) data, Richmond schools were 5.8% less expensive than average (in terms of “core” spending) because of those three factors. One final item: Richmond's excess expenditure for O&M is $2.8 million. Even if all that were justified (and given the sorry state of our old school buildings, it probably is), Richmond would be spending an excess $56.6 million. After these adjustments we are left with an estimated excess in our 2016 school disbursements of some 56+ million compared to the state average (recall that this does not account for disbursements for facilities, debt, or contingency). What we got for that money in 2016 was the second lowest math pass rate and the lowest reading pass rate among the Virginia school divisions. Until the RPS can explain where all that money is going and what we are getting for it, there is no reason at all to increase the school budget. 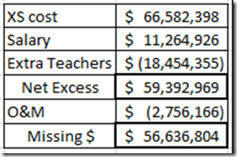 To the contrary, these data make a case for cutting the RPS budget by at least $56 million.